What is the most exquisite food known to mankind? Truffles? A perfectly ripened comice pear? 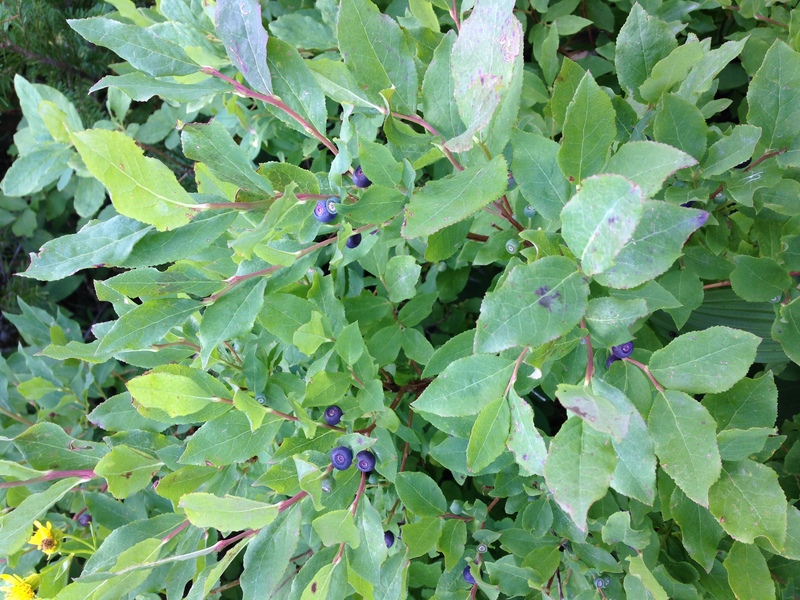 Huckleberries are found growing wild in lightly forested areas of Montana and Idaho between approximately 9,000 and 9,500 feet. (although they’ve been found as high as 11,500 feet) on northfacing slopes only on ground urinated upon by virgin albino elk. And so, it was with delight that I spotted an elderly couple recently approaching their pickup truck on an alpine dirt road carrying the delicate Dairy Gold pails that have justified the sale of ice-cream in large volume to Montanans and Idahoans for three generations. I had abandoned my duties as sag wagon driver to my husband and his pack of bicycling friends who were beginning the second leg of their continental divide ride from Banff, Canada to the Mexican border. We were in northwestern Montana and I was ready for a hiking break. My destination? The Jewel Basin, which lurks just south of Glacier National Park. The road to Jewel Basin trail head. I have profound memories of hiking here to a string of lakes, one of which lay at the base of an ice field, the bluish glacial slope slanting deep into the pool, guaranteeing the coldest swimmable water in the lower 48. I had told my 6- and 8-year old boys that if they completely submerged themselves, I’d buy them each a huckleberry ice-cream cone. 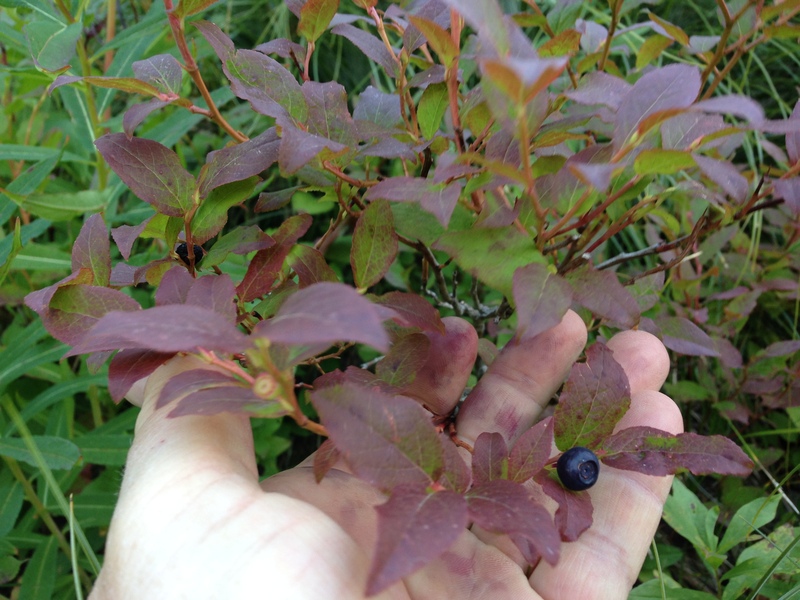 In my childhood, picking huckleberries was a duty, an obligation, a responsibility just as much as setting the table or doing the dishes when the chart on the fridge indicated it was my turn. But huckleberry picking was also a sort of honor, a privilege for the wealthy. If you could find them, glory was yours. So when I found a patch of the succulent dusky blue flat-ended berries, I pretended I had not. “Nope, just gooseberries over here,” I would lie. Meanwhile, I would stuff my face with the juicy treat. The best food known to humankind. My mother could not actually monitor how many huckleberries went into my square freezer pint container and how many went into my mouth. With four of us kids scattered through the bushes up or down an uneven hillside from a western Montana logging road stealing what was legitimately bear’s food from the largest predatory mammal on the continent, I suspect my mother was not worried about how many I ate. She would monitor the Dairy Gold pail into which we would empty our smaller vessels. My personal standard was two in the bucket, one in the mouth, two in the bucket, one in the mouth. My sister, who we’ll call Dana, of course was a little more greedy. She, I was sure, would put TWO in her mouth to just the one in the bucket. But since she was so fast, as older sisters are wont to be superior in every way, she somehow ended up with approximately the same amount in her square plastic container as I did. Even though she was five years my senior. My biggest failing as a huckleberry picker was not that I ate the profits. I was a clumsy child with oversized feet and disproportionately long arms. I would often spill the precious contents of my bucket/Tupperware/freezer pint thing. One time, when we were picking on the Marshall grade—a logging road next to the ski area east of Missoula, Montana, I set my square container down just uphill of a friendly fir tree to avoid such disaster. When my mother called from the rusting Volvo downslope, I couldn’t find my prize collection. I searched and searched, investigating every larch, pine, fir. But finally, fearing that my mother would actually leave without me, I plunged empty-handed down the hill to the car, stumbling into the road behind the car, it’s engine already running. I was terrified to be left behind with the bears. I was empty-handed. It felt awful. My mother didn’t notice, but my sister, Dana, did. And she was outraged. She accused me of eating all the berries I’d picked and promptly established that I would not get to eat anything containing huckleberries all year long. This would preclude me from participating in Thanksgiving dessert and possibly several birthday celebrations involving huckleberry pie. Also, Sunday-morning waffles would be huckleberry-jam free. It was the harshest punishment I could imagine. My mother did not enforce my older sister’s edict. If she had, I’m sure I would not be here to tell the tale. I’m sure I would have gone looking for that container, hiking the miles and miles through bear and mountain-lion infested woods instead of watching others eat all the huckleberry pie. The following huckleberry season, I was exonerated. Not because I picked more berries than my sister, but because when we returned to the same huckleberry patch on Marshall grade, my mother found my square pint container I had lost the prior year. A bear had found it first. The two large incisor holes in the side of the container, its edges shredded by a force larger than we knew our dog capable of, proved I had picked my share. I stopped and stared at the couple on the Jewell Basin Road. It was late August. Huckleberries? Still? They both nodded. It’s a late year. 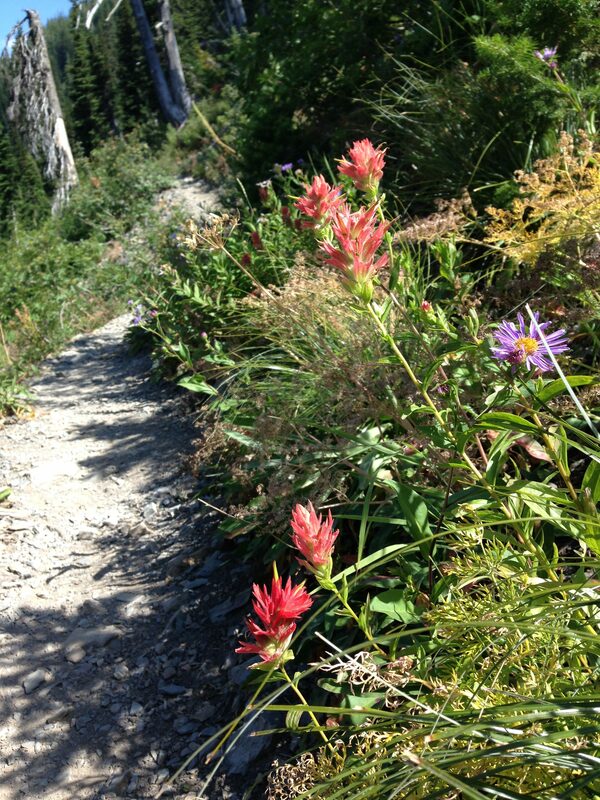 The Trail to Jewel Basin. 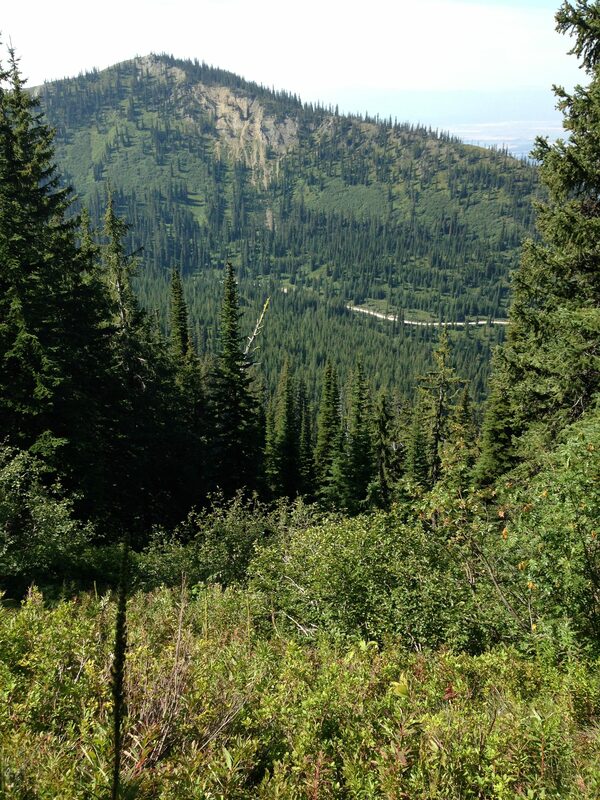 By the time I made it up to the lake I had eaten enough huckleberries to make myself queasy. But I managed to save about a cup, just enough to mash into the bicyclists lemonade a tablespoon at a time.